Suit up in this off-the-wall multiplayer adventure where iconic Disney characters and legendary Disney worlds collide. Discover the mixed-up humor of this ever-expanding universe as you team up with friends to overcome challenges and defeat enemies! You’ll never have more fun teaming up with friends to reclaim the universe. Get your own on Wii, PlayStation3 and Xbox 360. Disney Universe ESRB Rating: EVERYONE 10+ with Cartoon Violence and Crude Humor. Jump into the Cars 2 universe with some of your favorite Cars personalities in locations around the globe. Become a world-class spy and take on dangerous missions or compete to become the fastest racecar in the world! Available for Wii, DS, PlayStation3 and Xbox 360. 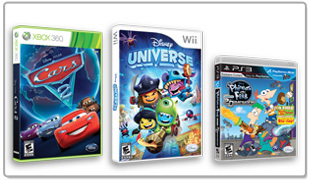 Cars 2 ESRB Rating: EVERYONE 10+ with Cartoon Violence. Train to become an agent of C.H.R.O.M.E. Get ready to take an exciting journey through never-before-seen dimensions in an all new action-packed game based on the Disney Channel Original Movie. Get yours on Wii , DS and PlayStation. Phineas and Ferb Across the 2nd Dimension ESRB Rating: EVERYONE 10+ with Cartoon Violence and Comic Mischief. Explore 25 outrageous levels powering up through 7 exciting worlds of gelatin, bouncy balloons, old-school cartoons and more! To get your $6 savings, print out a coupon and take it along with your Disney Rewards VISA card to any Best Buy before 12/31/11.